Did I just register for a FULL? OK. Time to get real, friends. I have now run 13 halfs/20K's, and I have the calluses and medals to show for them. I have no regrets other than wishing I had discovered the joy of distance running much sooner in life. I totally love this particular distance. It's far enough that it requires some training to prepare for it (at least for most runners, that is!). It's a long distance, but it's not so long that it will wear you out in preparation. And there is no greater bliss than crossing the finish line after running 13.1 miles (well, giving birth to my three kids might be a tad bit more blissful)....but I'm sure you get the picture. 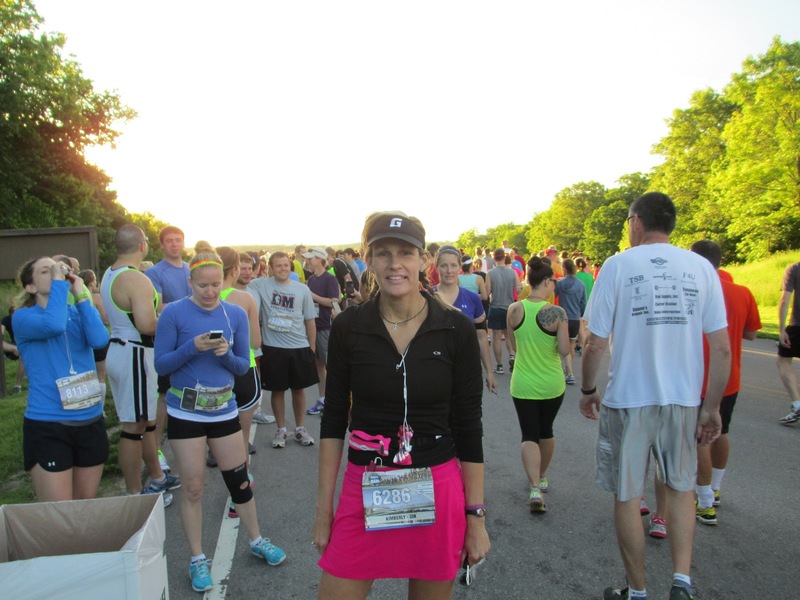 Even though a half marathon is no joke, I have enough experience in previous trainings to know how to train and what to expect while enroute to the finish line during the actual race. I have never been a daily runner. I respect rest days, I know they allow me to run at maximum efficiency on the days I'm not resting. I have confidence in my regular 3-4 running days each week, the only adjustment is to add a mile to the long runs 5-6 weeks before race day. Works for me. The thought of running a full marathon had entered my mind for a few fleeting moments in the 8 years I have called myself a runner. But since I have such a fondness the half marathon distance, I have successfully ignored those 26.2 thoughts. Until recently. 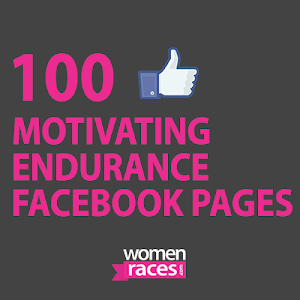 I started blogging about my love of running, and have shared this love on my Facebook page, Running on the Fly. In doing so, I have met many other distance runners, and many of these runners have embarked on the journey to a full marathon. They have taken the plunge. And, wouldn't you know it? Every one of them has encouraged me to do the same. UGH! Suddenly, all the reasons for not doing a full marathon were met with reasons TO do one. 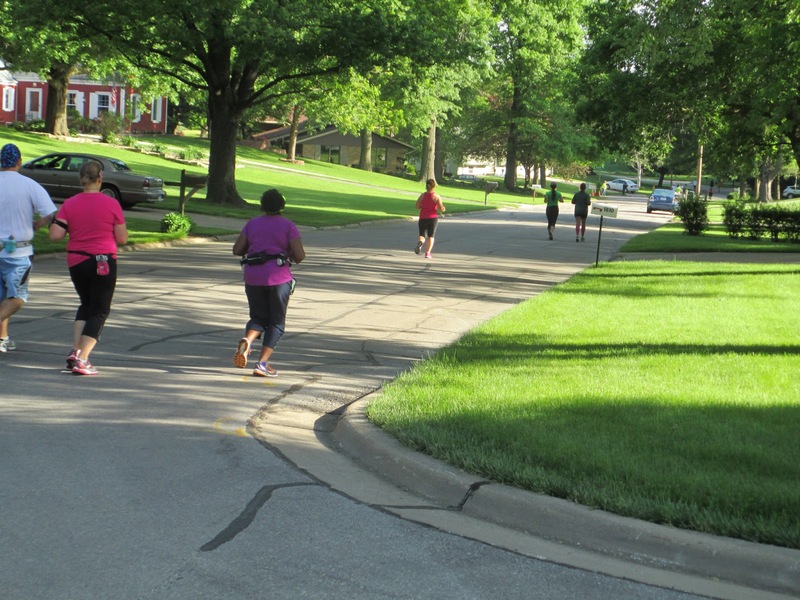 Although I won't be training on the same streets as these runner friends, we will all be training together this summer. All of our eagerness and excitement is overwhelming. We will be checking in and comparing running strategies, bragging about our weekly long runs and encouraging each other if any hurdles get in the way. 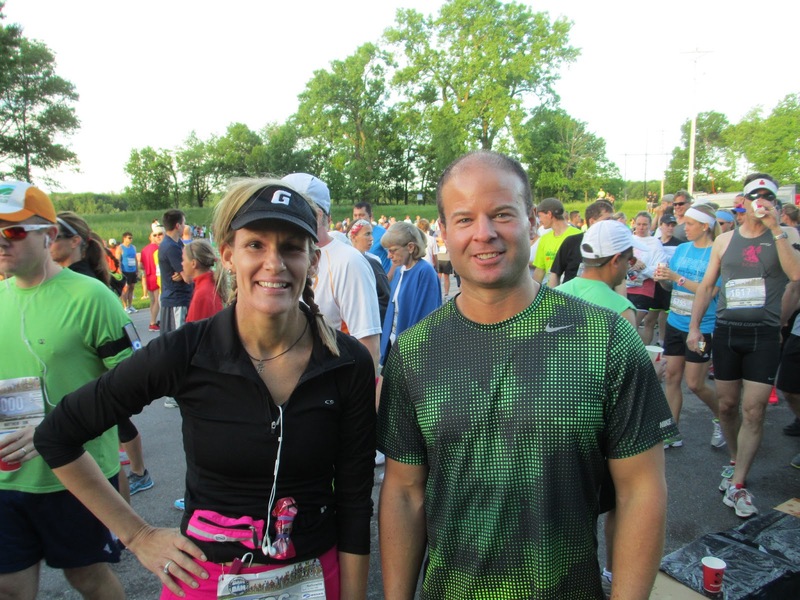 With this community of runners I have found myself embedded within, I pulled up the website for the Quad Cities Marathon. September 22nd is the day. The course is supposed to be "fast and flat." This could turn out to be a disaster, after all I will not only be running the longest distance I've ever run (13.1 miles), I will be doubling that! YIKES!. It will be a tough test, physically and mentally, but I know it is time. With debit card in hand, I hit the "submit" button. Honestly, it was such a relief to just have the registration done. I had been planning to do it, and had even made up a training plan...so when I finally made it official, I felt like a weight had been lifted from my shoulders. My first-ever trail run was, in a single word., T.O.U.G.H. I have been running consistently for 8 years, and have run all distances up to 13.1 miles. I have run fast (somewhat), and I have run slow. I have run hills. I have run in the wind, rain and snow. 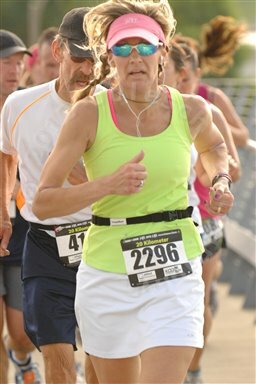 I think of myself as a pretty well-rounded and experienced "veteran" runner. Apparently, the running gods conspired and thought it was time to give me a really good challenge to test my endurance and stamina. 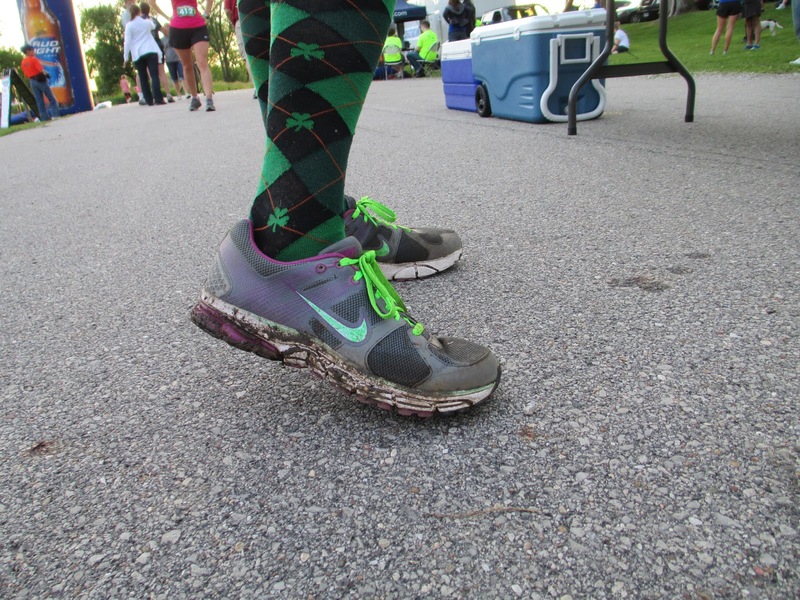 So, a trail run was presented to me. 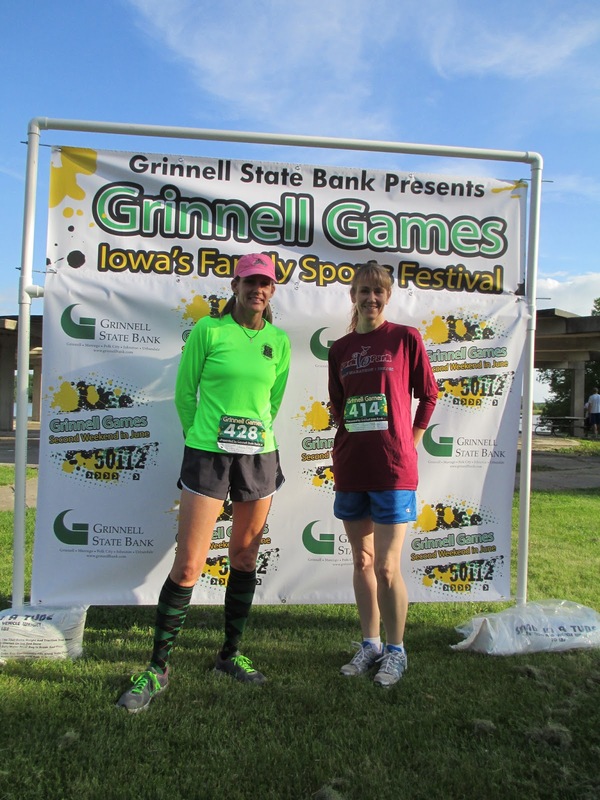 The town where I live has an annual event each summer, the Grinnell Games. They have a 5K, half marathon and a warrior run. 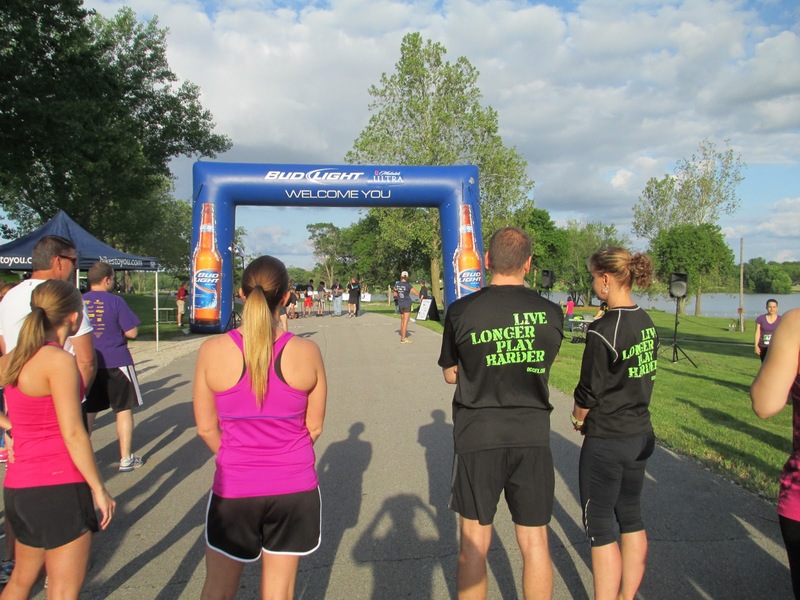 This year, they added a new event to the roster....a Twilight 10K Trail Run, and this trail run took place at a lake a few miles west of town. We have had a lot of rain in our area of the state (central Iowa), especially in recent weeks. 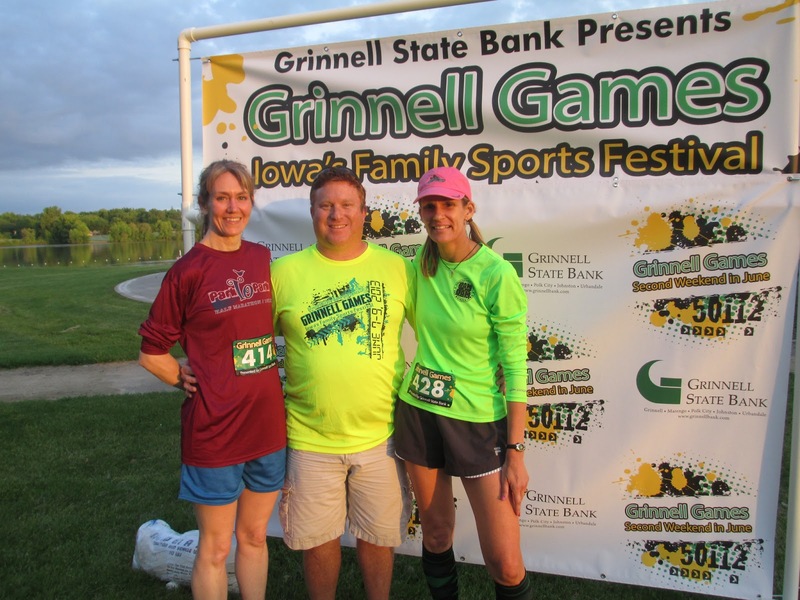 The grounds and some of the beach surrounding the lake were under water following the most recent storm, causing the directors and staff of the Grinnell Games to come up with an alternate route. Originally, the route was to take place on a trail path around the lake, amongst the trees and brush. Some of the original route needed to be re-routed to the pavement drive, and a portion of the route was changed to an out-and-back leg off of the main road. 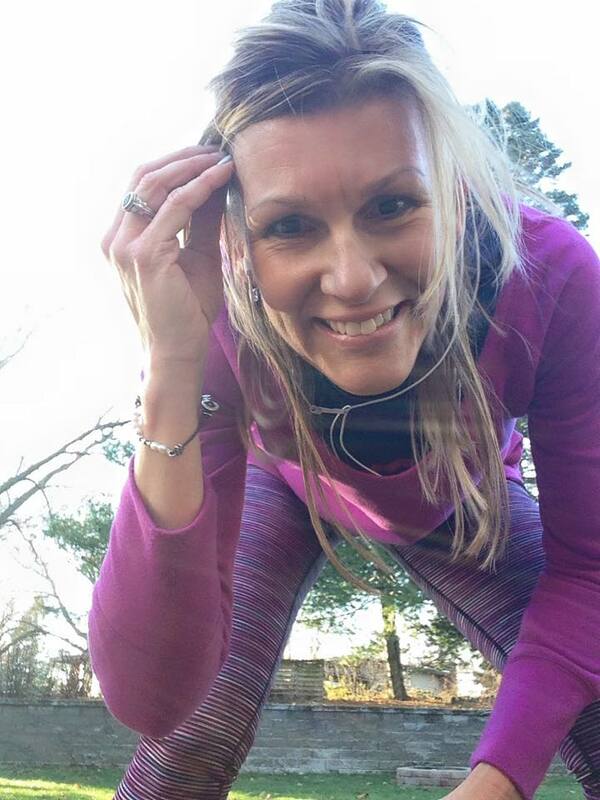 Having recently done a 20K race, I felt like I was in top condition for the challenge of a trail run. This event was "only" a 10K, half the distance of the race I had just completed a week prior. I was eager to do a shorter distance and test my skill on the terrain. I knew there would be a few hills, but since I regularly train on hills, I wasn't worried. I had heard to be cautious about wood ticks (YUCK!!!! ), so I bought a new hat to cover my hair, donned my festive green argyle socks to keep my legs covered and wore a long-sleeved tech shirt. 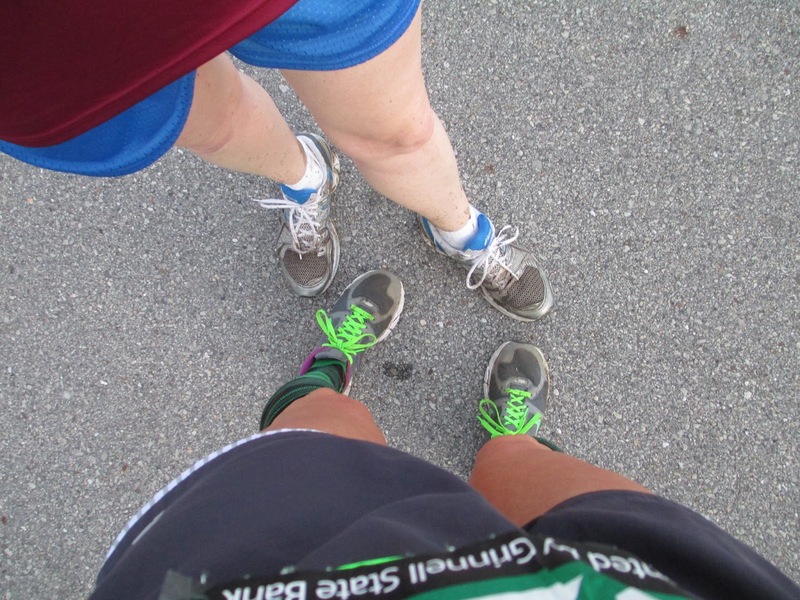 My friend, Kristin, also wanted to take on the challenge of a trail, so her and I drove together to the event. We took a few pre-race pictures and I even had a guy with a video camera interview me about the upcoming trail run and my impression of the Grinnell Games. The race began after a great rendition of the National Anthem, performed by some local band students and bagpipers. The first couple miles (or so) were on the paved drive. And those first couple miles were hilly and curvy! Having had some recent trouble with my piriformis muscle, I could feel some discomfort almost immediately. I tried to go easy and not strain myself, but the constant uphill striding was disheartening. They had told us we'd turn off of the drive and be on grass "for awhile" and the second water station was the turn-around. As soon as I turned onto the grass, I knew I was in for another bitter challenge. The grass was tall, probably 6-8 inches in height, and very muddy in places. This required a different kind of running than I was used to. I needed to lift my feet higher than normal for each stride. Hello, piriformis muscle! Yes, I know you are there, and you can feel every one of these steps! By this point of the run, I was pretty much by myself, all of the runners had spread out. There were some painted arrows in the grass, but nothing else to really gauge my where-abouts. Since this was the first year for this event, it was probably an oversight to not have mile markers, and that was a little frustrating. I had to slow down and walk, quite a lot actually. I had some idea how far I had been running but wasn't certain about the exact distance. All I know is that I went for a very long time in the grass, brush, mud and rocks without seeing anyone coming back from the turn-around. Since I did take time to walk, I took a few pictures along the way. Unfortunately, several pictures didn't show up on the memory card, but I do have a few to document my journey. It was difficult running on the terrain. Many times, it was sloped sideways, almost at a 45-degree angle. I was careful navigating my way, and walked when it looked dangerous. I could feel my ankles constantly twisting and going sideways, and I didn't want to take any "heroic" chances and get injured by going too fast through dangerous territory. 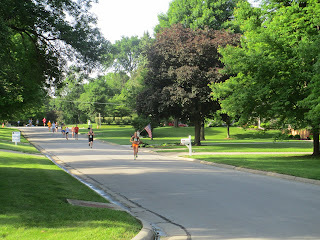 It wasn't until I was probably half a mile from the turn-around that I finally saw some of the runners coming back. Everyone looked very serious, I congratulated them on doing so well...and not many smiled. Most of them grunted, probably because they were focused on their footing and trying not to fall. It was funny seeing all the mud on everyone's shoes and legs. I was really glad I'd thought to wear my knee socks. Finally, I reached the turn-around and stopped for a few seconds to have some water. The volunteers were very cheerful, and encouraging. They asked me how I was doing, and I told them that this was the toughest race I'd ever done... last weekends 20K was EASY compared to this 10K. So, I tossed my water cup and started to make my way back. As I passed all the others coming towards me I clapped for them, and told them the water was just ahead. One gal actually smiled, and said, "Thanks!" This course was constant hills, on the pavement and off of it. There was not really any terrain that was flat. If I wasn't fighting gravity going uphill, I was fighting it on the way back down...and trying to not go too fast for fear of losing my footing. Even when there wasn't part of a hill to tackle, there was sloping terrain, slippery grass or sticky mud or wood chips. Despite the constant awareness of my footing, I was able to look up periodically and enjoy the beauty of the leaves, the scent of pine trees and the sounds of nature all around me (I had left my music at home). 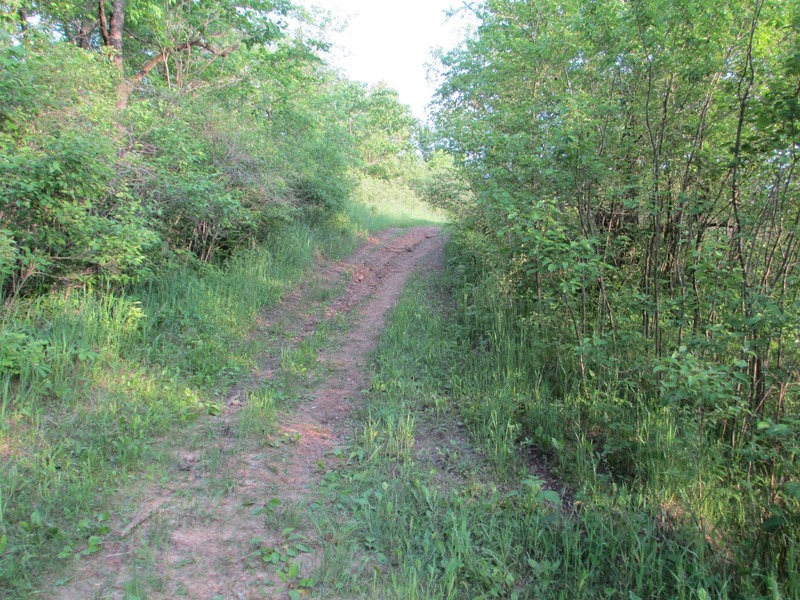 Once I finally made my way out of the brush and got back on the pavement, I felt like I had been set free. A friend (volunteer) greeted me and told me I was doing great, and that lifted my spirits tremendously. He told me I only had half a mile left to the finish line. 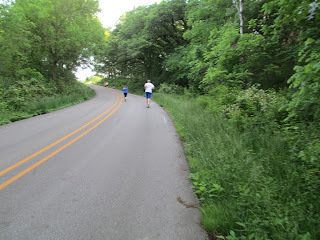 Even though there was a slight hill remaining, it was amazingly easy to sprint the remainder of the route. I rounded the final curve and made my way to the finish line and was greeted by lots of cheers from the other runners and spectators. The camera guy even found me in the crowd and wanted to do a follow-up interview (he didn't ask me for my autograph, though). Even though I was really struggled at times amongst the course, I did enjoy this race. I finished in 1:07:45, not great in terms of my "usual" 10K finish time, but I am satisfied with it. I had to walk a lot more than I wanted to, but given my recovering piriformis muscle issues (and my lack of grace on uneven terrain), my finish time is decent. 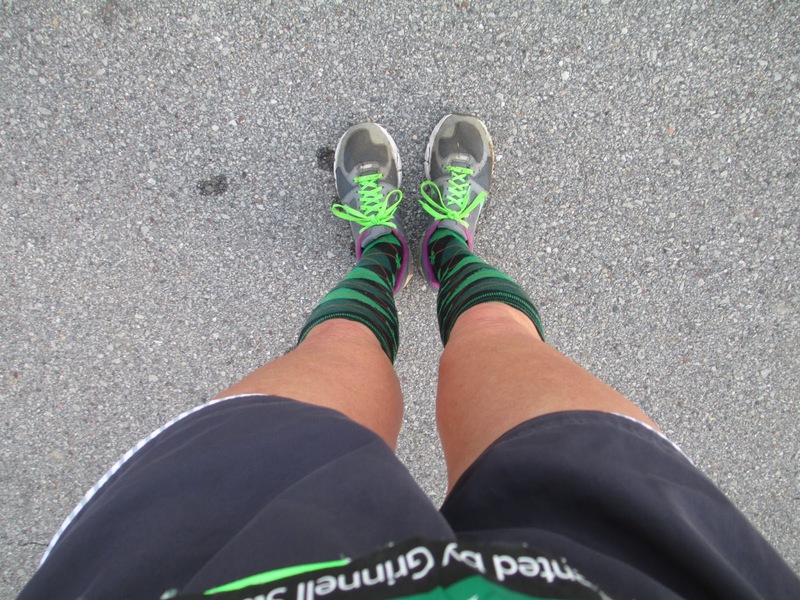 I will take a slower-than-desirable finish time over an injury, any day. It was a little frustrating never knowing exactly how far I had run or how far I had left to go, so I suggested they add mile markers next year. I actually had a moderate headache for most of the race...not sure if it was due to the new hat or if it was legitimately from something else...none-the-less, that made for some discomfort and was a distraction at times. When I do future trail runs (because this definitely will not be my last! 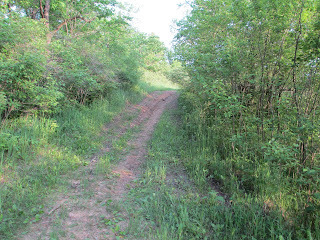 ), I will train on actual trails for them, and possibly consider getting some trail shoes. My ankles were contorting in every direction while running, so I was thankful no damage was done. My quads were quite sore the next morning, probably from the constant high-stepping through the tall grass and the gravity-induced "stomping" as I descended the numerous hills. 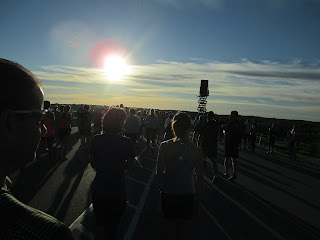 On a side note, I volunteered for the half marathon the following morning. I ran it last year (a week after last year's 20K), and that was not a smart move in my running career. Besides, having done so many races in the past 8 years, I think it's only fitting that I give back to the sport that has given so much to me. I have been on the receiving end of numerous events, and none of these events would be possible without volunteers (many of which are runners themselves, sacrificing their run so others can do it instead). The half marathon route goes right by my house, so I spent a few hours dressed in a glow-in-the-dark vest and acted "all official" re-routing traffic on my street corner. 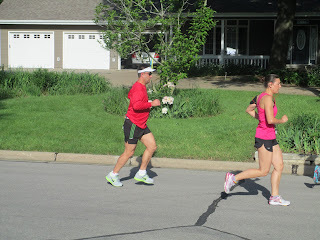 I also cheered every runner as they came by and gave them plenty of cowbell. When I began my journey 5 years ago on distance running, Dam-to-Dam was my first long-distance event. It required me to plan out my running a couple months in advance, gradually increase my distance and start building my endurance. 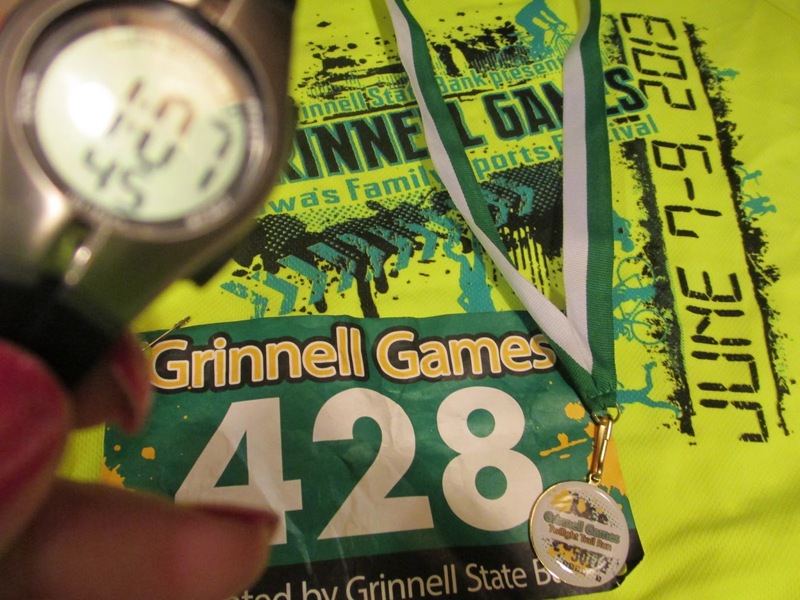 And, I had to prep my mind for the absolute exhilaration of crossing the finish line after running the course. 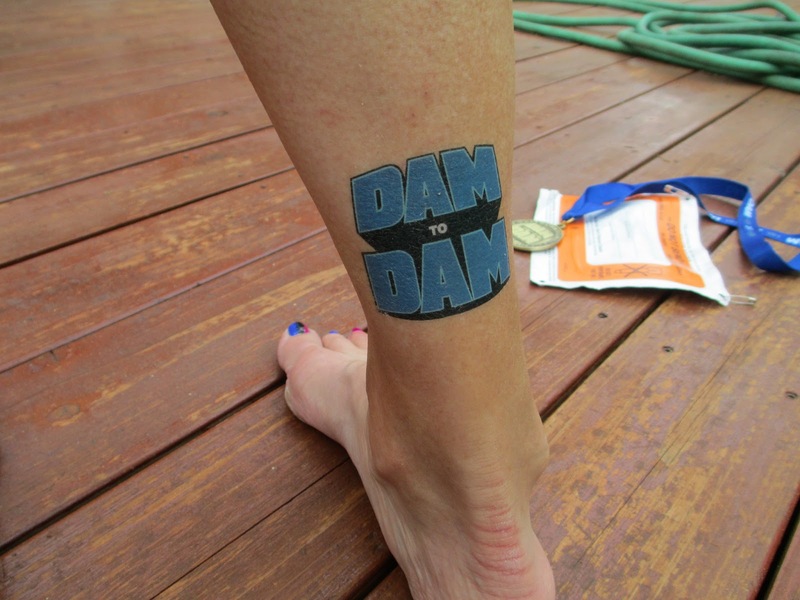 Fast-forward to June 1, 2013, and I crossed the finish line for Dam-to-Dam for the sixth consecutive year. As much as I love the distance, each long race presents a challenge and this race was no exception. Looking back, I can safely conclude most of the challenges of yesterday's race were things I ultimately had control of.....and that is a good thing. First of all, for most races I have the challenge of getting enough sleep. Not only am I a night owl, but most races I do are at least an hour drive away...so I have to get up extra early to get to the race location. I have a difficult time falling asleep before 11:30 most evenings, and it's even more difficult if I'm excited about racing the next morning and worried about missing the alarm going off in the very early hours. I know I am relaxed as I contemplate the events of the race...but I am not in the deep REM sleep necessary to be fully alert the next morning. 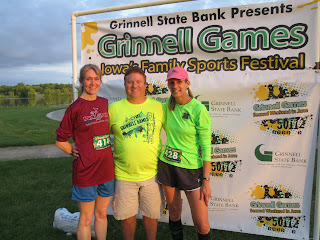 This race began at 7:00, and the shuttle buses left from downtown Des Moines at 5:00-5:45 to get the racers to the start line at the Saylorville Dam.....so I was up at 3:30AM, to allow for a 4:00 departure to get to Des Moines by 5:00, park the car and make our way to a shuttle bus. 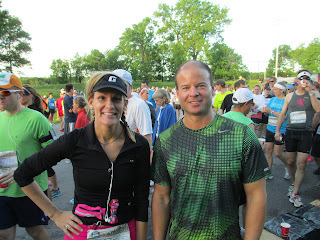 Myself and Bill, a friend and fellow runner, made the (not too) bright and early journey together. The weather was absolutely perfect. I have done this race for the past five years, and the weather is never predictable. It has been very hot and humid, it has been cool and breezy, and one year it rained. Yesterday, it was around 60 degrees at the start of the race, ideal racing temps but a tad bit chilly for an hour or so prior to start time when the sun hasn't risen very far in the sky. I love the excitement of seeing all the racers lining up at the start line. I feel some anticipation and anxiety, but for the most part, I'm just glad to be there and eager to run. For this race, we line up on the Saylorville Dam, and as we look to the south, we can see the Des Moines city scape....12.4 miles off in the distance. It's really exhilarating to know that in a couple hours, I will be there amongst all those buildings. A local high school band played the Nation Anthem, and the race began. Since this race begins on a dam, it is pretty narrow and crowded for the first mile. I know the first couple miles will be a little slow, and I have learned to just go with it. I also know if I start off too fast, I will pay dearly for it later, so a crowded start such as this actually helps ensure I will conserve my energy. As predicted, my first mile was a little over a 9-minute pace, but by the time I finished my second mile I had already made up some of that time and was back on my "normal" pace (between 8:30-8:45). 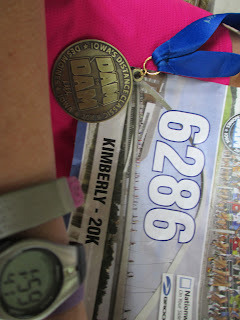 I was able to keep a decent pace (well under a 9-minute pace) for the first half of the race. Unfortunately, I was already experiencing some minor distress from my shoes. I could feel a few blisters forming on the balls of both feet, and the toe nail of left big toe was rubbing on my shoe. Not good. I was wearing some shoes I'd had for a couple years, and I had worn them quite a lot for recent training runs. Apparently, the short runs were all these shoes had left in them...and by mile 3, I was really regretting lacing them up that morning. So, with every step I was dreading the next. Again, not good when there's 12.4 total miles to be run. 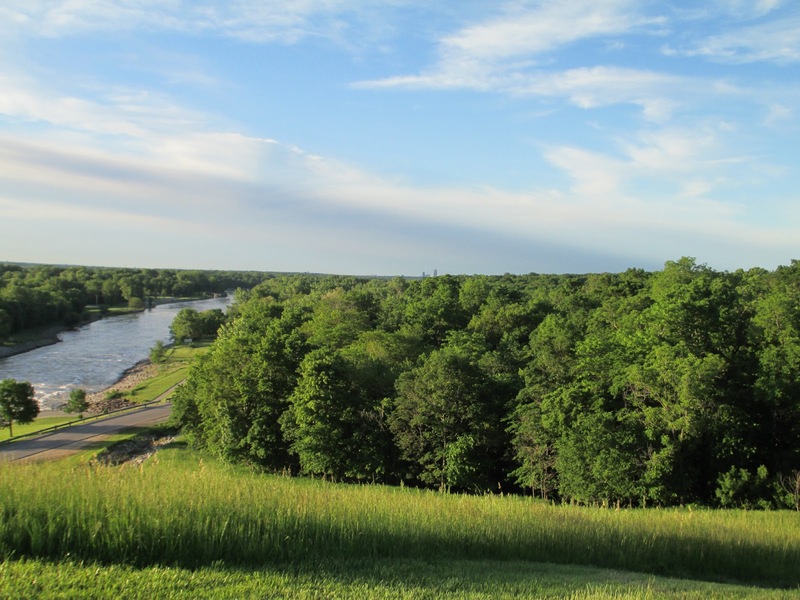 The route for Dam-to-Dam starts in a rural setting, north of Des Moines. 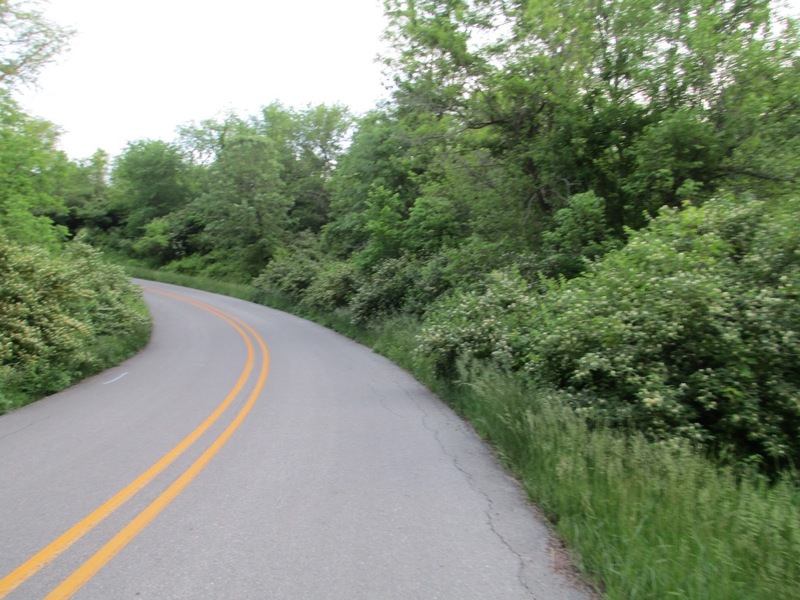 There are some curves, and very gentle rolling hills along the first half of the course. There are water stations at every mile, and lots of spectators along the road. Just before the halfway point, we cross Interstate 80. I always wonder what the casual tourists think when they see all of the runners on the bridge over I-80 before 8:00AM on a Saturday morning. Most of them honk at us, and I always make a point to wave at them. Despite my shoe discomfort, my split for the first 10K was 56:25, just barely over a 9-minute pace. I was starting to have doubts if I'd be able to PR, though. Last year, I finished in 1:55 and I was hoping to finish under 1:50 this year. 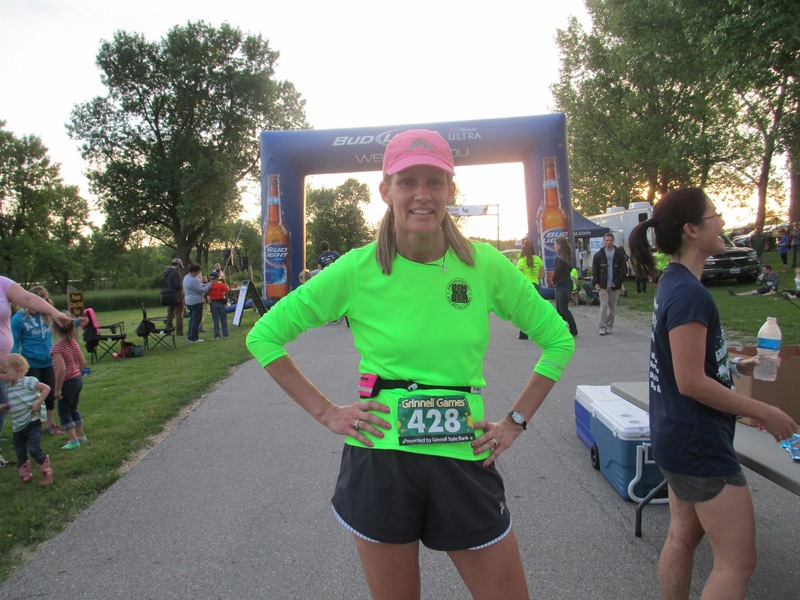 I would really need to stay on pace and kick it into high gear to finish with my goal time. Having done this race before, I knew what was coming up at mile 8...a big hill that I had only successfully ran the entirety of it once in my 5 previous Dam races. It is a long hill, probably most of a mile, and by that point of the race I am starting to feel some fatigue. I usually do an energy gel at the halfway point, but the water station was in between mile marks at this location...so I didn't get my gel until after the 7-mile mark, and it didn't seem to take effect in time. So, much to my disappointment, I walked for some of it. 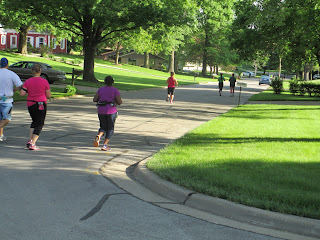 My feet were on fire, but I knew I still could pick up my pace after this hill was over. So I pressed on after the hill, still staying pretty much on pace...but I could also tell I was feeling weary from all the foot pain. 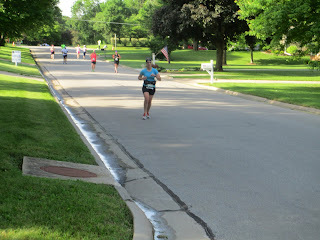 Mile 9 came and went, and I was really having trouble focusing on the finish line because my feet hurt so bad. I knew the pain was only going to get worse with each step, but I had to continue. Suddenly, I realized no amount of pain could put a damper on this race for me. Did I really need to try for a PR when my shoe discomfort would make it so difficult? This is a race I have done 5 times before, why not just relax and enjoy the experience of being here? 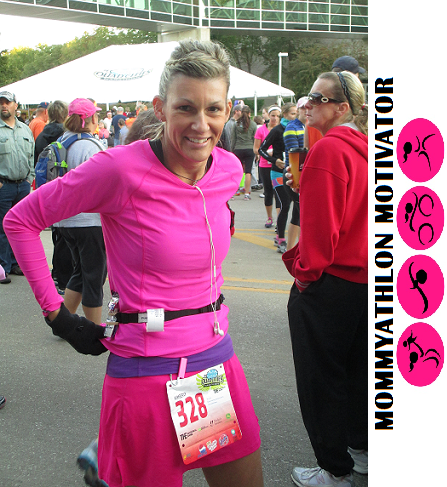 We all have runs and races that don't go as planned or anticipated, maybe this was destined to be one of those for me. I (momentarily) couldn't control the pain from the swelling blisters on my feet, but I could control my experience. As I approached the end of mile 10, I still had plenty of foot and big-toe discomfort, but I let myself slow down and walk briefly. Of course, when I slow down and walk usually that means my body will want to have a potty break, too. So, I grabbed a water and waited for my turn at a nearby porta potty. I don't like messing with my race time by taking the porta pot breaks, but since I had let the PR goal evaporate, it was a necessary evil. My mind had been cleared of the PR, and I actually felt a brief moment of calm wash over me. After taking my break, I glanced at my watch and noticed it said 1:36 .....quickly my mind did the math and realized I could still potentially finish under 2 hours if I allowed myself to really focus and draw some mojo from deep within. I had approximately 2.5 miles remaining, maybe I could do it! The foot pain was excruciating, but I took off and eagerly made my way through the remaining miles. I knew I would be cutting it close, but I was going to try. 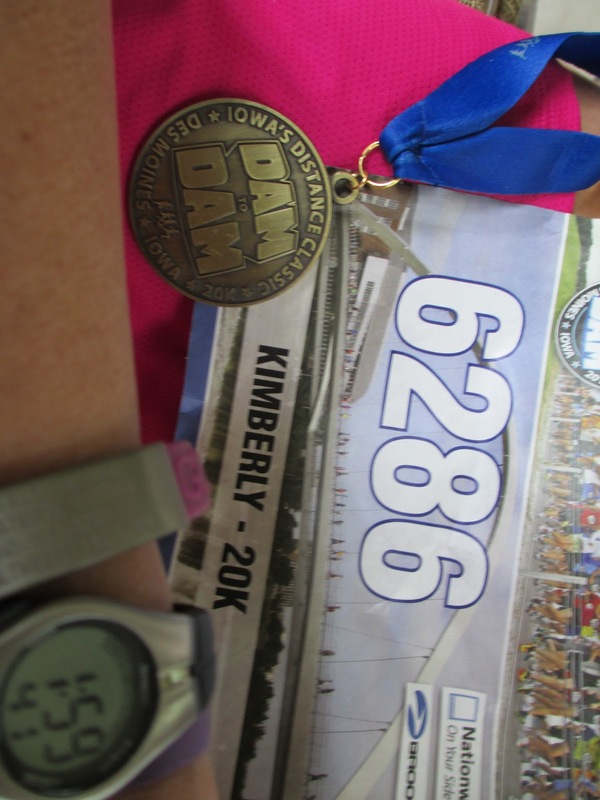 My second fastest time in finishing Dam-to-Dam was 2:02:30 (in 2010), so just maybe I could beat that if not the coveted 2:00:00 mark. The final few miles go through some neighborhoods (lots of cheering people), along business areas (lots of crowd support and extra water), and finally, along a river (near the "destination" dam) in downtown Des Moines. My "rational" mind kept telling myself that I'd finish "around" 2 hours, so there was no need to stress out over trying to finish any faster. And my "running" mind reminded myself that I would regret not finishing strong and at least trying to finish under 2 hours. I kept telling myself, "just keep going." Just keep going. Usually, when I do distance races such as this, the second half goes much smoother and faster than the first half. 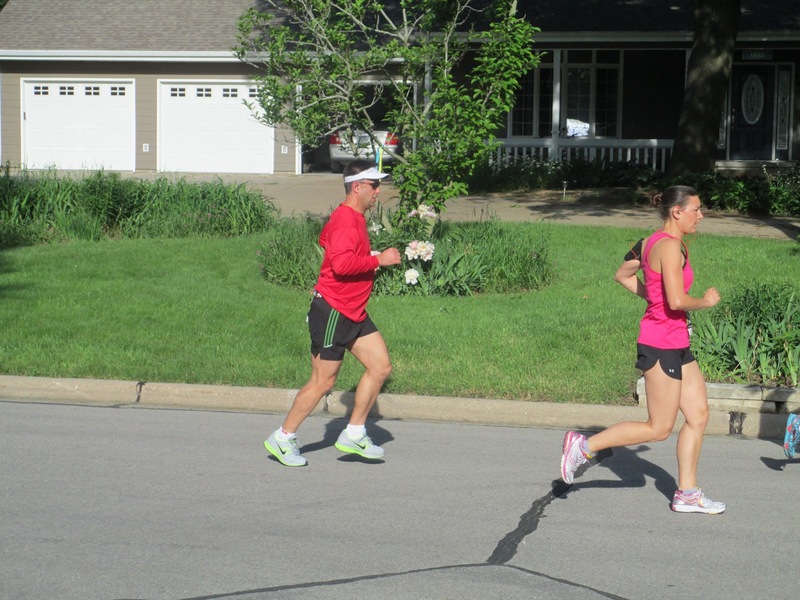 I usually get a huge energy boost for the final 3-4 miles, and that runner's high carries me through to the finish. That was not happening this day. It really took a lot of discipline to keep going and not walk during those last couple miles. But I kept pressing onward, finally reaching the walking bridge over the river and having only about a half mile remaining. That was when I finally got my energy...I was able to kick it in for the final length and cross the finish line.....officially in 1:59:54! I would have loved to PR and finish faster than last years time of 1:55, but I was very happy and completely satisfied. I was pleased to finish under 2 hours, but even more proud of myself for the power I was able to draw on those final few miles to get to the finish line. 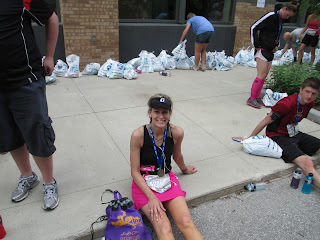 I graciously took my finisher's medal, posed for a quick picture and then promptly made my way to the bag claim area. I didn't even grab a water or Gatorade. I had a pair of flip flops waiting for me in my bag, and time was of the essence. My feet hurt so bad, I was tempted to lose the shoes and walk barefoot...but common sense told me to do otherwise. I found my bag and wasted no time in discarding the shoes and socks...and all was well. 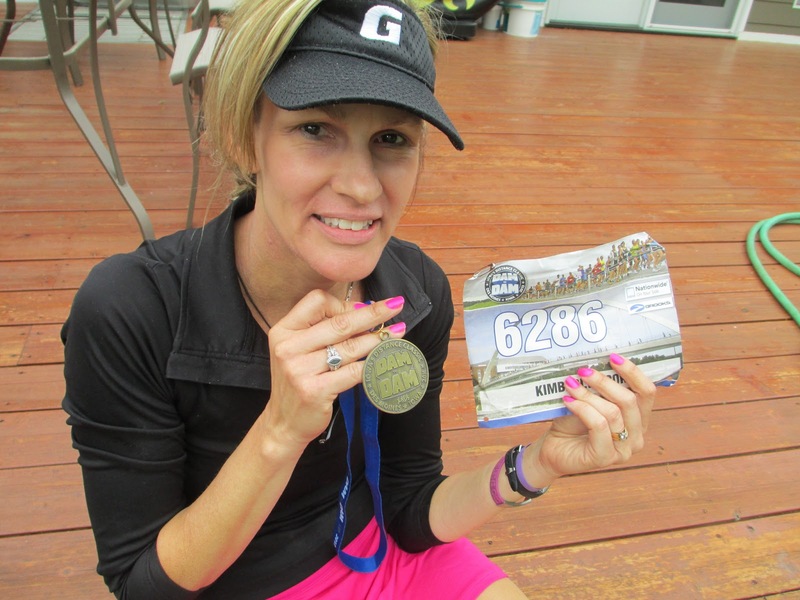 So, what did this race teach me? The great thing about running (or any sport, or life experience) is that there is always something to learn. 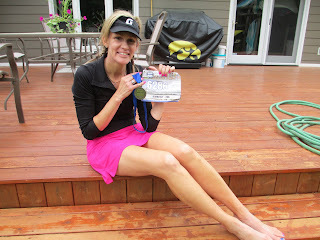 I trained well for this, but an additional long training run could have been beneficial (I had a serious golf ball injury on my foot, so I elected to not do that final long run to be cautious). I need to seriously work on my sleep habits (and program my mind and body to "turn off" at an earlier hour). Make better choices in race day shoes (even if the old shoes have felt great on shorter runs, they may not hold up for anything longer). Not every race will be 100% great, PR's are great but they shouldn't dictate your entire race day experience. And, even when the race is not going as great as hoped, be thankful to be there running anyways...it just may turn around.